The sensational murder was no spontaneous act by an enraged fanatic. It was a well-thought out, cold-blooded plan. Was the executor acting alone, motivated only by ‘religious fervour’ as projected, or is there more to the issue than meets the eye? And even if his act was purely altruistic, should the law of the land not be applied to punish him? The Governor was already a target of the ‘hate-filled organisations’ as he termed them, well before they saw an opportunity to (ab)use the ‘blasphemy law’ to unite their own until then divided ranks. For this, they needed a target. The opportunity arrived when a trial court sentenced a Christian woman, Aasia Bibi, to death on Nov 8, 2010, for ‘blasphemy’. The ‘religious parties’, historically divided amongst themselves, have never made any significant headway in electoral politics in Pakistan. A democratic dispensation does not suit them. Although Pakistan under Gen. Musharraf officially cut ties with the Taliban regime in Afghanistan after 9/11 (reluctantly, the last country to do), it continued to allow the ‘home grown jihadis’ to operate, seeing them as useful to keep the fire smouldering in Indian administered Kashmir. In Feb 2008, a democratically elected government replaced Gen. Musharraf’s military regime. The new government eschewed the earlier policy of using non-state actors to achieve its foreign policy objectives – but the security establishment remained wedded to the outdated paradigm of ‘strategic’ depth (i.e. Pakistan’s continued influence in Afghanistan because of a perceived threat from India). What does all this have to do with Salmaan Taseer and the politics behind his assassination? Everything. The mindset and political ideology disguised in the rhetoric of religion is furthered by a security establishment that sees its duty as being to protect not just Pakistan’s physical frontiers but also its ‘ideology’, developed along conservative religious lines since the 1965 war with India. This ideology was strengthened during the Afghan war of the 1980s, when a national war of liberation was converted into a ‘holy war’ (as Dr. Eqbal Ahmad pointed out in his talk on ‘Terrorism, theirs and ours’, 1998). Pakistan’s ‘religious’ organisations flourished and gained strength with Saudi and American backing during the Zia years (1977-1988). They were allowed to function freely during the military-dominated ‘musical chairs’ years in which no government could complete its tenure (1988-1999). As mentioned above, they also had a free rein during the Musharraf years (1999-2008) even after 9/11. Since the end of the first Afghan war, these organisations have been targeting and killing religious minorities and progressive minded people in Pakistan. The genie released during the Zia years and nurtured under Musharraf was not going to go tamely back into the bottle. Governor Taseer was already in their sights for his outspoken and rational views on religion and human rights. He had no qualms naming the organisations he suspected to be behind the May 2010 massacre of worshippers in an Ahmedi mosque in Lahore, where over 80 people were killed and scores of others injured. “These hate-filled organisations – Sipah-e-Sahaba, (Lashkar-e-) Jhangvi — they all have same ideology – Taliban, Al Qaeda…,” he said during his condolence visit. “They should be prosecuted in the courts,” he said. “Don’t let them off. There should be zero tolerance towards them. No political alliance is possible with these organisations, you can’t go around having them at your political meetings, the Punjab government should prosecute them”. Five months later the religious parties found a way to unite their ranks by conflating the ‘blasphemy’ issue with the issue of the ‘honour of the Prophet’ (peace be upon Him), when there were protests against the death sentence of Aasia Bibi. The ‘religious’ organisations came out in full force calling for her death because she had allegedly said something derogatory against the Prophet (peace be upon Him). For some years the ‘blasphemy’ issue had lain somewhat dormant. Now, after many years, a court handed down a death sentence for such a case. Protests against the sentence by human rights and Christian organisations led to counter protests by ‘Islamic’ groups that used the issue to build up their political strength. The situation was reminiscent of the early 1990s when there was a surge of ‘blasphemy’ cases, and the first ‘blasphemy murder’ was committed. Between 1986, when the law came into effect, and 2010, 1,081 people were charged under it, including 138 Christians, 468 Muslims and 454 Ahmadis, according to the National Commission for Justice and Peace (NCJP). In all cases investigated by human rights groups, motivations for these cases have been invariably rooted in rivalries or disputes related to money, property or other jealousies. There was no case registered against Governor Salmaan Taseer but the propaganda against him was amplified by the proliferation of the 24/7 television channels and social media. Taseer was publicly projected as a blasphemer. The aggression of one particularly vitriolic television talk show host led the Governor to rebuke her: “You are acting as I am guilty of blasphemy” (watch the programme here and here). Sunni Tehrik and other extremist organisations held rallies and demonstrations against clemency for Aasia Bibi and against proposed procedural amendments to the ‘blasphemy laws’ that PPP MNA Sherry Rehman sought to table. Put on the defensive, the government as well as opposition figures who had agreed to support the amendments, backtracked, leaving Rehman high and dry, her life under threat. Mumtaz Qadri was a known figure at such rallies where emotions were being whipped up. He even recited ‘naat’ at some of them – like at this one, just three days before he killed the man he was supposed to be protecting. How was a man who attended such gatherings, who was already known for his extremist views (he had been earlier removed from the Special Branch because he was perceived as a security threat) inducted into the Elite Force in the first place? How was such a man assigned guard duty to a high profile target like the Governor Punjab? Why did the other guards not expose Qadri or get him arrested when he told them what he was going to do and asked them not to open fire, as he would surrender (as he said in his confession after his arrest)? Given that the other guards did not open fire, according to standard operating procedures in VIP guard duty, why were they not charged as accomplices to the murder, even though Qadri said he was acting alone? Citizens for Democracy (CFD), an umbrella group of several professional and activist organisations formed on Dec 19, 2010 in Karachi, raised such questions in its statement of January 7, 2011. “We reiterate our stand that no one has the right to take the law into their own hands and kill anyone, regardless of whether they are accused of blasphemy or any other crime,” said the statement, endorsed by nearly 70 organisations. But such voices were drowned in the din of ‘religious’ righteousness. Qadri’s fellow guards who were detained after Governor Taseer’s assassination were released without being charged, as was the cleric whose inflammatory sermon convinced Qadri to pull the trigger. Salmaan Taseer’s murder was followed just two months later by the murder of the Minister for Minority Affairs Shahbaz Bhatti, a Christian by faith, who had also been outspoken about the blasphemy issue. No one has been arrested for that murder. The trial court judge who sentenced Mumtaz Qadri to death has fled Pakistan for his own safety. Qadri’s supporters are calling for the death sentence to be commuted, which is somewhat puzzling given that Qadri has stated he is willing to die for his faith and he believes he has done right. Pakistan has many pressing problems – including the perennial ones of clean drinking water, healthcare, education, shelter and so on that directly impact the people. But on a larger level, there is also clearly an urgent need to enforce the rule of law — charge, try and prosecute the guilty without fear or favour — and to expose the hypocrisy of the Taliban mentality that is tearing the country apart. Those murdering rationality and nurturing extremists should rethink their strategy because its not taking us anywhere but to a closed alley. “Laakh hakiim sar bajeb ek ‘kaliim’ sar bakaf”. Violence can be met only by violence. As it is, those who are afraid of death are no match for those who welcome death, though death is the ultimate fate of all the living. 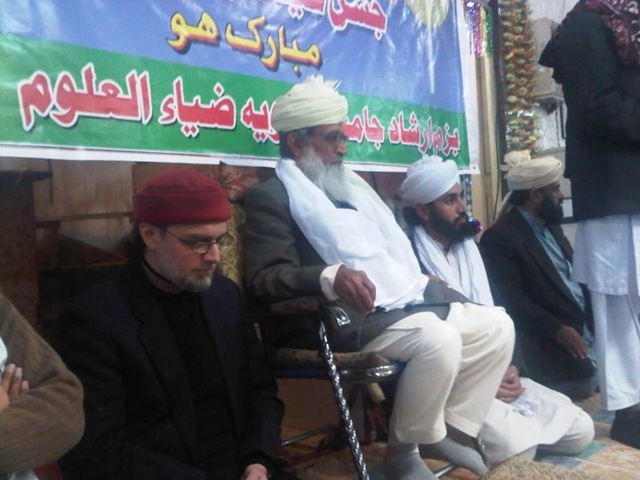 So no wonder people garland Qadri for his daring to kill a governor and face death, religiously or in-religiously. Respectfully, I disagree. Non-violence and peaceful protest are in the long run far more powerful. That is where the moral high ground lies, which we cannot yield. Also, if Qadri was so keen to face death, why did he ask the other guards not to open fire as per S.O.P. (standard operating procedure) when he attacked the unarmed Governor from behind (truly the act of a coward) and why are his followers demanding that he be pardoned and not punished?